Availability: DISCONTINUED. No longer available. The Design House 205799 11 in. 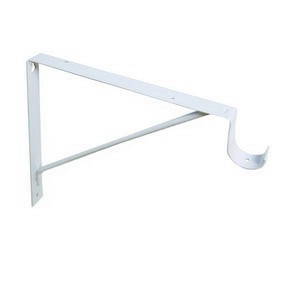 Shelf Rod Bracket is used to supporting shelving. Reliable hold and easy installation. This unit features a white finish. 1/8 steel construction wood screws included. 9 in. center to center wall mount. With years of hands-on experience, Design House understands every aspect of the home decor industry, and devotes itself to providing quality products across the home decor spectrum. Providing value to their customers, Design House uses industry leading merchandising solutions and innovative programs. Design House is committed to providing high quality products for your home improvement projects.